College advisers are recent graduates from any institution and have received their bachelor’s degrees in a variety of academic disciplines. No previous experience is required as college advisers participate in a five-week pre-service training program each summer prior to commencing service in their partner school. They are trained to advise students on how to choose a college that matches their interests and complete all processes related to college planning, admissions and financing. In addition, college advisers provide parents with the information they need to encourage and support their children’s pursuit of a postsecondary education. 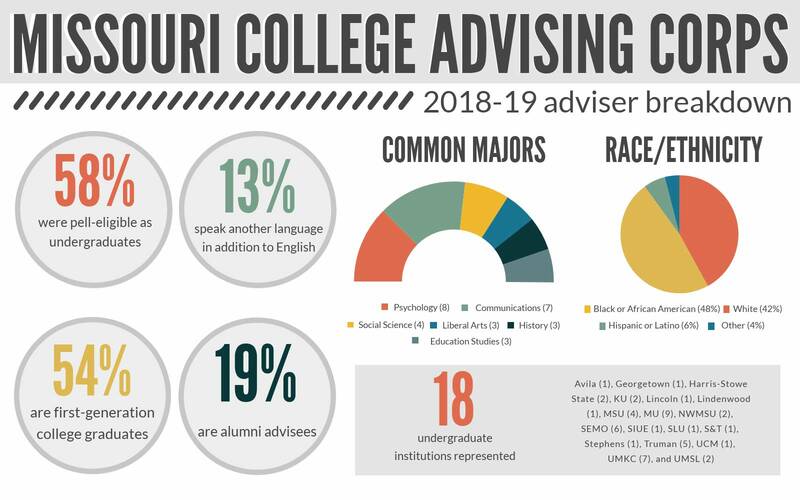 I understand MU Extension will deliver more information about the Missouri College Advising Corps and upcoming application deadlines to my inbox. All fields are required. You may unsubscribe or change your preferences at any time. Applications will be available January 1, 2019 until filled for service in 2019-20. Priority consideration will be given to applications received by March 1. College advisers are placed in high schools and are immersed in the school setting. Advisers work closely with the schools’ counseling staff and work with students both in one-on-one and group settings. College advisers do not recruit students exclusively to any college or university but help students find their “best fit” institution, wherever that may be. To see a full list of activities conducted by advisers view the Purpose page. Learn more about our current advisers. Or read about the successes of past advisers have had since their time with MCAC.